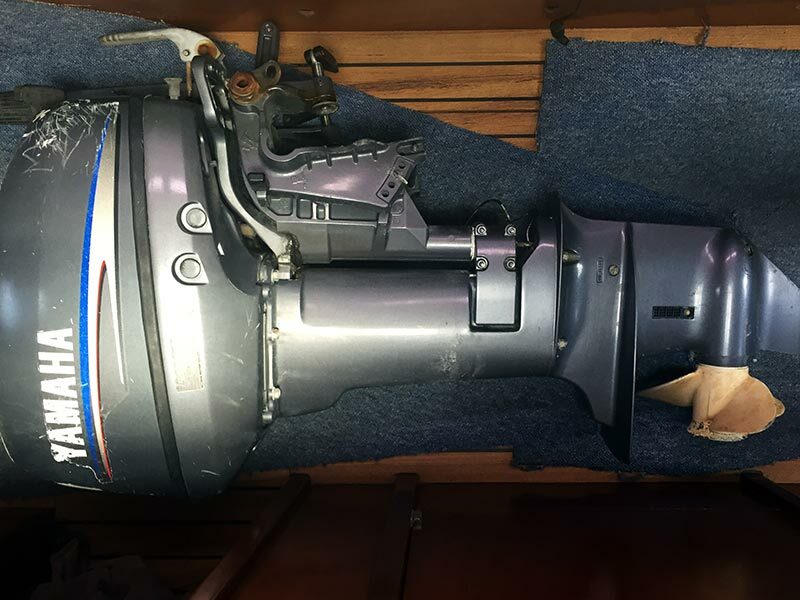 Yesterday, after Rebecca squeezed in one final on-shore workout, and after verifying that we had just enough provisions to do us until Tuesday morning, we set to work to clean up and store our outboard engine and tender. This procedure would leave us boat bound, but as we anticipated the job might take a bit of time, we didn’t want to leave it until the last moment. Step one was to disconnect the fuel line and allow the engine to run dry. If you’ve never done this, it’s surprising how long an engine will run with the fuel line removed. Once it had ultimately run out of fuel, we used one of the davit lines to bring the outboard engine up on deck, and then proceeded to give it a good scrubbing. There were some tiny barnacles hidden in the crevasses of the lower unit that required a screwdriver to remove, but other than that, fresh water and a scrub brush was all that was needed to clean it up. It was suggested by both the gentleman who owns the mooring that we’re on, and the owner of the gardiennage service, that we store the engine inside the boat, rather than leave it on the rail. We heeded their advice, and set the engine in the salon. Although not intuitive, be sure that the outboard engine is resting with the tiller side down. When it came to cleaning the dinghy bottom, we decided to try something different to what we normally do. 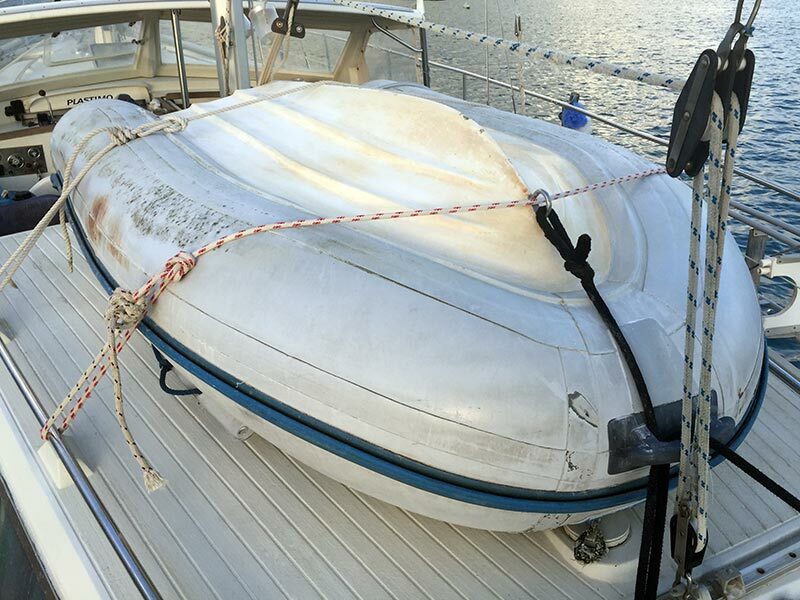 Rather than taking the dinghy to a beach to clean it, we simply flipped it upside down in the water, and then climbed on board with some brushes. If you try this, be mindful of any barnacles that may be on the bottom. They can leave a nasty cut! The dinghy cleaned up pretty well with just elbow grease and salt water. We did try a bit of no-name kitchen cleaner after most of the nasty stuff was removed, and it helped a bit, but mostly it was the scrubbing with a stiff brush that did the trick. 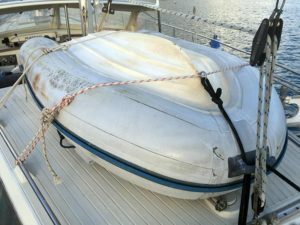 After cleaning the hull and tubes as best we could, we worked to secure the dinghy to the aft deck. As we have always just used the boat’s davits to store the tender, even during inter-island passages, this is the first time we’ve tried to lift it out of the water like that. It took a bit of experimenting to get it up on deck, but once we did, we were pleased to see that it fit just as we had imagined. 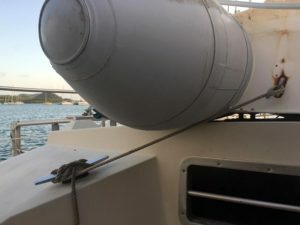 With multiple lines securing it to the deck, a couple of which were tightened using trucker’s hitches, we’re pretty sure that the tender isn’t going to go anywhere, even in a blow. Fortunately for us, even if something does change during our absence, we have someone on island who can make it right. 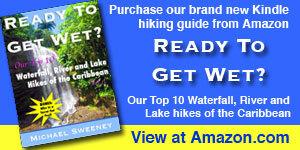 While you’re here, be sure to check out Rebecca’s latest post. It includes an aeroSling workout video, the last that’ll be recorded on this boat. For now, at least. Last chance to get a photo taken like this! Also drain the carburetor. Store the engine inside for security reasons or something else? Ratchet straps work well for securing the dink. Security. 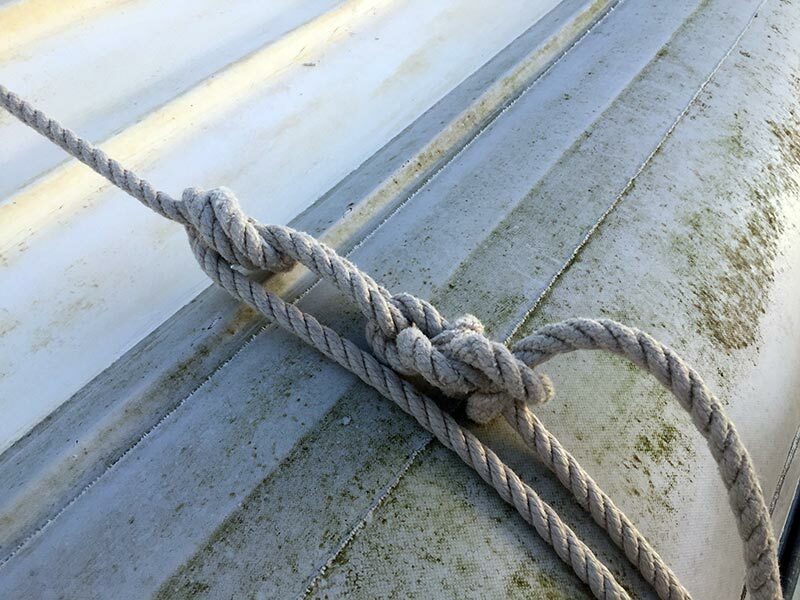 As for ratchet straps, yes, they’ll work, but I am old school… I prefer lengths of rope with proper knots.